For the music I play with my band I switched to in-ear monitors few months ago. I especially had a hard time finding a limiter that would fit into my personal setup, this article might be helpful for someone in a similar situation. I decided to go in-ear to properly hear myself singing during rehearsals and forthcoming shows – it completely solved the problem by the way. 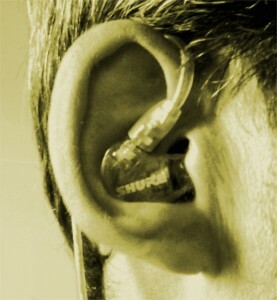 Being also the guitar player in the band I never was interested in wireless in-ear monitor systems. My idea was to use the guitar cable and to double it with an earphone cable of the same length. Doing this way frees me from frequencies problems and discharged batteries. 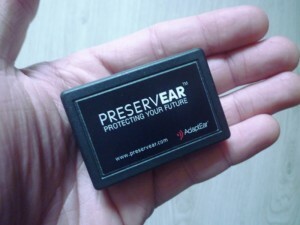 A limiter keeps your ears safe by blocking the sound volume to a specific treshold. Few milliseconds of a sudden loud noise into the earphones are enough to damage your hearing for life (like a microphone fall, a larsen…). N.B : If you are talented you’ll still have the opportunity to write this kind of stuff. 1. It will always be activated and you’ll get a crappy sound in the ears. 2. Worse, it won’t trigger enough or won’t trigger at all when you need it. 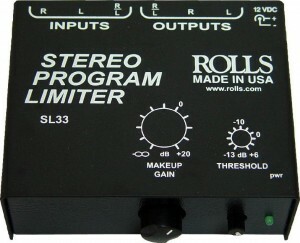 Avoid limiters like the Rolls SL33, which are not meant for that use : the knobs are not accurate enough to know the exact value of your settings. They were rather made to control the volume of the TV between programms & commercials. If you’re using wireless IEMs with a non adjustable built-in limiter in your system, be careful to check if the limiter works correctly with your earbuds. If you’re using your system’s provided earbuds you should be OK but if you plan to buy new ones choose them with the same sensitivity / impedance than the originals. Then there are limiters in the 19-inch rack format like the often used Aphex Dominator. I find this format interesting when the whole band goes IEM or when you already have rack format effects, otherwise it’s another bulky thing to bring. As far as I’m concerned, I’m the only guy using in-ear in my band. I got a Rolls PM 351 mixer / headphone amp, fixed on my pedalboard to easily reach the settings of the 3 channels. So I just needed something adjustable and small. 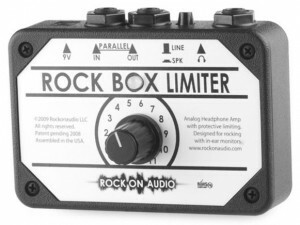 The Rock Box is analog, works in mono and has only 1 channel. It receives a line level or a speaker signal, you can either plug in the dedicated cable of the wedge or the mix from the FOH. 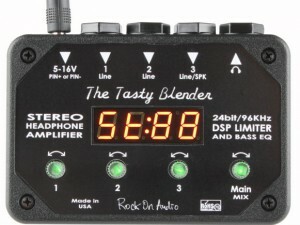 The Tasty blender goes a little bit further : it’s digital, has 3 channels, works in stereo and has 3 limiters & a small EQ to adjust the bass. I already had my mixer / headphone amp (the Rolls PM 351) so I didn’t lingered on it. Furthermore the Tasty blender doesn’t have any output. On the PM 351 2 of the 3 channels have an output. I can plug my voice microphone on one channel, the output of my guitar amp on the other and then send the 2 signals separately to the FOH. I’ll still be able to hear myself properly even if the sound guy gives a mix in a single canal or if we play in creepy bars tiny venues where there are no wedges at all. On the other hand if you’re 100 % sure the sound guy sends you separated signals the Tasty blender might be worth it. 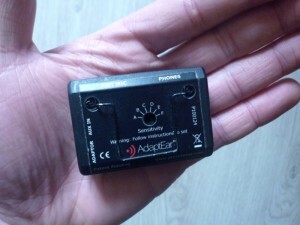 Eventually I found the PreservEar : a simple passive attenuator / limiter that holds in the hand, and adjustable depending on the earphones. I set up the wheel in the back with a screwdriver depending on the sensitivity and impedance of my earphones and the exposure duration. A red led lights up when the limiter is working. The light came on several times since I’ve been using it (few months). If I push the volume all the way up on the Rolls the sound goes heavily distorted but not too loud, which is a good sign. Otherwise I never had any problem hearing the mix in my earphones when I’m playing with my band… and we play loud. The PreservEar does undoubtedly what he’s asked to do. I plug my guitar cable into the pedalboard and the headphone extension on the PreservEar. The latter goes directly into the headphone input of the Rolls PM 351. An output of the guitar amp comes straight into the Rolls. My voice microphone plugged into the Vocalist goes on another input of the Rolls. 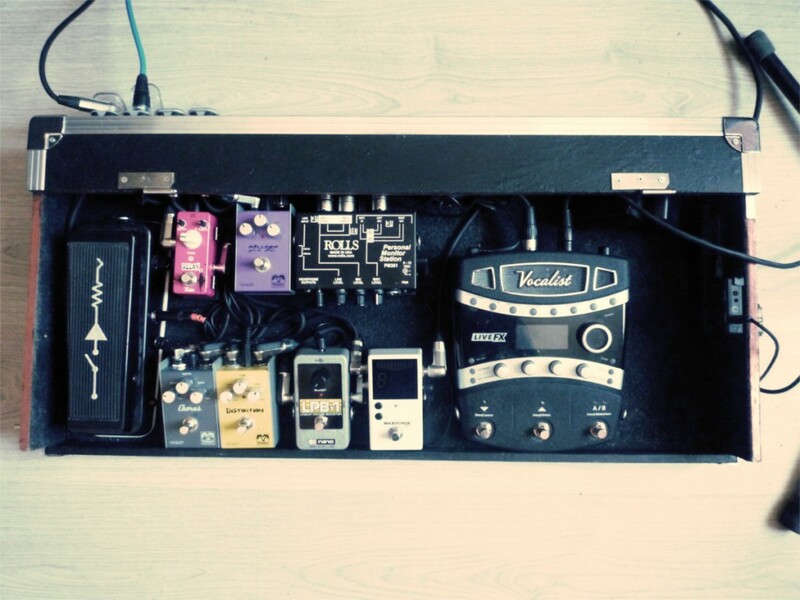 The Rolls outputs are connected into the pedalboard outputs in the top left. The only thing left to do is to connect to the FOH with XLR cables. That’s it. I hope I helped you in your search. If you have any question / observation feel free to notify me by mail or in the comment form below.